Reposting sadya style cabbage thoran with video of its preparation..hope you find it useful. 1. Combine the sliced cabbage, onion, grated coconut, turmeric powder, green chilies, curry leaves, salt (you can add salt later while cooking the cabbage) and 2 tsp coconut oil with your fingers. 2. Heat 2 tsp oil in a pan over medium heat. Splutter mustard seeds and fry dry red chilies. Add the cabbage mixture and mix well. Bring everything to the center and cook covered for 2 minutes. Open the lid and stir-fry for 3 – 4 minutes until cabbage is done (do not overcook, it tastes best when slightly crunchy). Serve this yummy cabbage thoran with rice and other side-dishes or with yoghurt, chammanthi and potato/pavakka mezhukkupuratti. It tastes yum! Nanmayum samridhyum niranja Vishu ashamsakkal to you and your family, Maya and Lakshmi..
Nice cabbage thoran. Loved ur version. Wow.. looks delicious and congrats on your awards and thank you so much for sharing it with me.. Very simple and yummy recipe you have. Love the clicks very much. 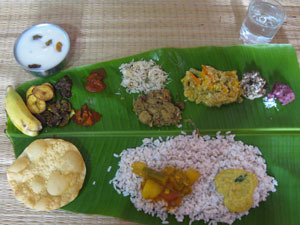 Perfect Thoran 4 Today;s Sadya !! Thanks a lot 4 sharing the awards with me…Will post them soon ! Happy vishu to u and ur family..My all time favourite poriyal..
Wow…looks very delicious. I love the addition of coconut. I’m sure it adds lovely flavour to the dish. I would love to try, Thanks for sharing. thoran looks fresh n crispy…happy vishu to u! this yummy i’ll definitely give a try for this recipe.. it is so simple and tasty. All time fav thoran…Looks delicious…. i was lookin for this recipe.wonderful. cabbage looks thin and crispy..looks so yummy!! can you please advise me how much salt exactly you add to the thoran. I don’t use a food processor to chop cabbage. Please use a knife to chop them finely..
Can you suggest a good brand knife please . You seem to be slicing cabbage very easily. Great to know that you loved this dish 🙂 Hope you like the other Kerala recipes you try. Do let me know if you have any questions. Happy cooking!